Kimberly Cecil has helped hundreds of women, children, and men who have experienced trauma (such as interpersonal violence, assault or abuse) to heal from those wounds and move forward in their lives, building confidence and enriching their relationships. Kim has also worked with individuals struggling with the sexual orientation and/or gender identity. Following completion of her master’s program (which included intensive training in counseling), Kim worked in outpatient community centers. 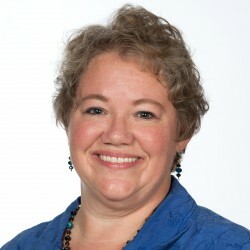 Prior to joining the Health System in 2014, she spent five years working with University Students as a staff member of the Northern Illinois University Counseling and Student Development Center. Kim Cecil specializes in anxiety, depression, and LGBT-related issues. She is able to create strong bonds with her clients, and they report that she is deeply empathetic. Kim utilizes emotion-focused and exposure-related techniques, as well as imagery, mindfulness, and metaphor. Kim works with children as young as 6, adolescents and adults, and families; sometimes working with family members helps to bring a solution to light more quickly.